In the garden or the studio, Emma Young isn’t the sort to look for shortcuts. In letterpress printing, a platen refers to the flat metal plate that presses against a piece of paper to create an impression. Today most “letterpress” is done on a computer, but Young is committed to the look, feel, and process of working with a platen press. In addition to the press, Young needed spacers, rulers, type, and ink to get her letterpress business running. In 2012 she found a collection of type in Portland, Maine, and got another large press from a Lambert’s Cove neighbor. 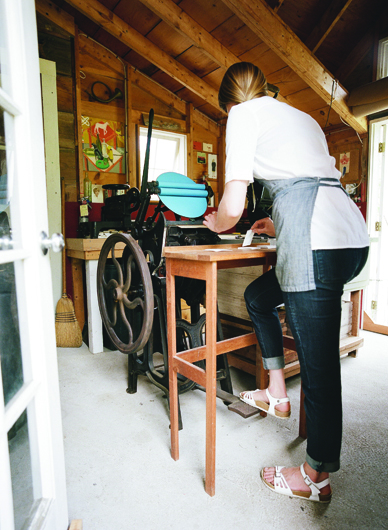 Sometimes in her studio Young imagines herself as one of those printers in a striped shirt and ink-covered white apron. Largely self-taught, she relates to Polk’s fragmentary instruction. 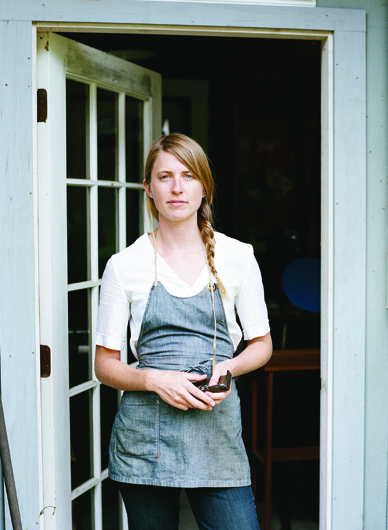 Young took a book arts course with a letterpress component when she was a student at Hampshire College, in Amherst, Massachusetts. But learning to use the old-fashioned tools that she has a penchant for was an entirely new undertaking. Young’s studio is a repurposed animal stall on Cackleberry Farm, her parents’ property off Lambert’s Cove in West Tisbury. When you enter her artistic domain you might meet Bebe, the energetic mutt who looks like a miniature black lab, or Tea Cup, the lazy orange barn cat. Honeybees buzz and hover over two hives in front of the studio. Across a field of greens is the home her parents, Scott and Terre, built in 1984 where she and her brother, Mac, grew up. Scott Young does restoration construction and has a knack for homesteading. The evolution of his land into a small but productive farm has been ten years in the making. His specialty is garlic, of which he grows several varieties. Cackleberry Farm also produces lettuce, tomatoes, peppers, eggplant, onions, squash, herbs, and eggs (“cackleberry” is 1950s diner slang for an egg). There are also fruit trees and honeybee hives, and in the past the Youngs have kept goats and sheep, but now that pastureland is dedicated to growing veggies. Since she moved back to the Vineyard five years ago, Young has taken over marketing her dad’s produce and selling it to local restaurants. The father-daughter duo has an easy working relationship. He farms for the joy of it, learning about different plants as he goes. Young makes sure everything is ready for market at the right time, not letting anything slip by. “I like seeing our work go out into the world,” she said. With type set and oil ink mixed, prints are created by hand, and foot, one at a time. 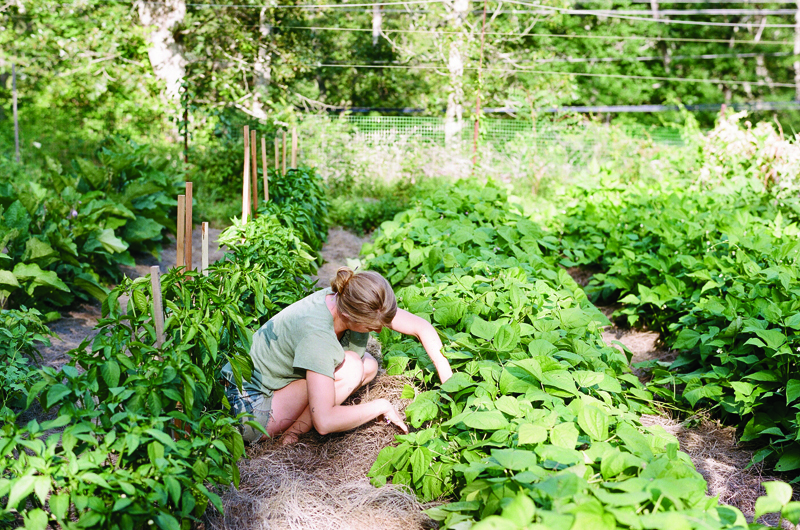 “Words, books, plants, and growing.” These are Young’s most favorite things, she said, and having her studio right on the farm has allowed her to do both. And yet her work is so strikingly simple and beautiful, with delicate details – teeny lavender flowers in this particular case – that it’s not hard to see why she is steadily busy. Young tries to do as much paid work in the summer as she can handle, which allows her the time to do more creative, personal work in the winter. This past spring she was named West Tisbury’s poet laureate, and recently wrote, printed, and published a collection of poetry called Tomato Skin Diamond. She also did the print work for Island chef Chris Fischer’s The Beetlebung Farm Cookbook, which was published in June. Sarah Soushek of Oak Bluffs heard about Young’s work through a friend. She already had a vintage vibe in mind for her September wedding and when she and her fiancé, Colin, went to visit Young at her studio, she knew immediately their styles were compatible. “Emma has such an artistic eye, but she keeps it within the parameters of her nineteenth-century equipment,” Soushek said. When not in her studio, Young gets her hands dirty helping out with farm chores. For instance, when Soushek was debating whether to include a wedding website on the invite, Young pointed out that a URL would conflict with the nature of the art form. Soushek ultimately agreed. Recently, Young has been emerging from her studio in the early evening for cocktail hour with a friend at the nearby barn where she lives. They have been making herbal beer from wild plants foraged on and around Cackleberry Farm. Looking contentedly far away from her old Upper West Side apartment, Young was anticipating that evening’s beer. “That kind of cocktail hour feels really right,” she said.